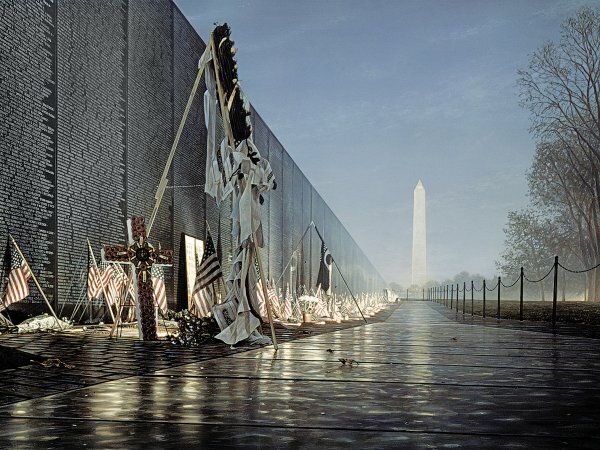 Line of Duty by Rod Chase ~ The Vietnam Veterans Memorial Wall contains the names of 58,226 men and women who were killed and remain missing from that war. The names are etched on the black granite panels that compose the Wall, and the panels are arranged into two arms, extending from a central point to form a wide angle.The names are listed in the order in which the men and women died or were declared mission. The first death was recorded in 1959 and the last in 1975. More than 500 individual names are readable in the Chase painting. Line of Duty, the original work, was inspired by the photography of Larry Powell.